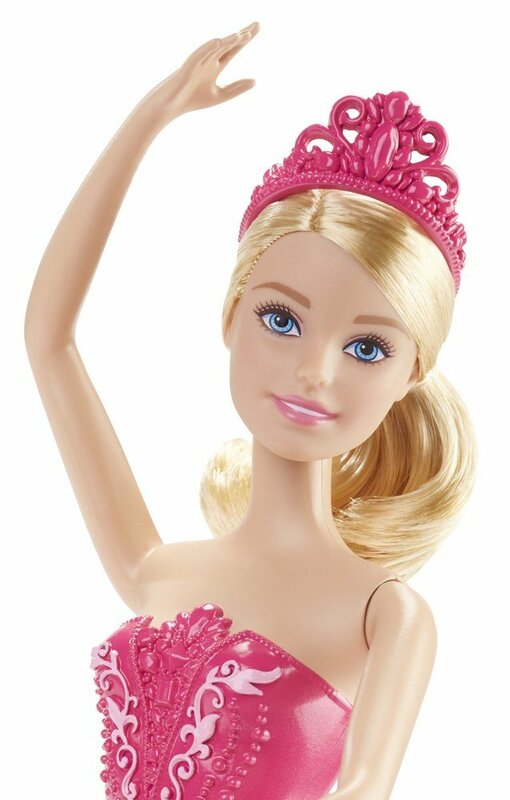 Color:Pink This Barbie doll is dressed to dance the day away in a stage-readyballerina costume. Whether gracing the stage or pirouetting into a scene,she's ready for you to start the show! Barbie ballerina doll wears an attachedbodice with delicate detail and a removable tutu in a sheer pink fabric. Amatching removable tiara and attached toe shoes (with detailed painted tights)complete the prima ballerina look. With a polished ponytail and posed arms,this dancer won't miss a step. Collect all of the Barbie fairytale dolls forendless storytelling possibilities (each sold separately, subject toavailability) -- because with Barbie, you can be anything! Includes doll,removable tutu and tiara. Doll cannot stand or dance alone. Colors anddecorations may vary.